It’s always the way, work hard to beat the rain and then the rain decides not to come. It is summer cover crop planting time and we had been watching the forecast thinking it looked like a good bet that we would get rain to water up newly sown seed. First it looked like the front would come through this evening and so we had Tuesday and Wednesday mornings to get it all done then, at the last minute, they pushed the time forward to this morning. Yesterday was a sprint finish to slow race that’s been unfolding for a week or so. As the spring vegetables come out we mow off what’s left and to help keep the weeds down, the same with the early spring flowers, finally we give it all one more mowing and cut it all in with the tractor. I did that last Sunday since it was dry enough to work soil after the last rains. I like to let it lay there a few days allowing all the just turned up weeds to perish in the intense summer sun, that was the slow part of the race. Yesterday was the seeding day. First spin out the cowpea seed (we always plant a legume to capture the nitrogen from the air for free) and then because it is a large seed and needs good soil cover to germinate we have to cover it lightly with the tractor, so around and around I go. Then I walk back over the rough field and spin out the sudan grass seed (we always plant a grass with the legumes to grow huge amounts of organic matter to feed the soil), the grass seed is small and doesn’t need to be covered especially if a good rain is on it’s way. Of course that was not the only item on the mornings agenda which included some last minute mowing and tilling for some other crops we wanted to get planted before the rain. Cov and Elizabeth trellised some celosia and continued the red onion harvest, with other projects I would throw in from time to time as I came by. Check in with the NC State research folks who were out to take measurements of their tomato plots. I did manage to get most of it done by noon when the staff leaves and we disappear into the house for the heat of the day and it was a hot one! I planned to go back out late and finish up. By 3:00 there was the rumble of thunder and it looked like even earlier rain, damn! So back out I go to finish the seeding and to roll out some Italian bean seed that we brought back to try, seed some more cucumbers and the rain starts to fall, just enough to chase me out of the field but not enough to get the ground wet. Done, a three T-shirt, two sets of shorts day. Now this morning it appears as if the rain has passed us by and there is no more forecast for a week or so, I may have to try and water these cover crops up, arghh! On the tomato-stealing-critter front we had to resort to surrounding the tomato tunnels with the electric net fencing as I have not been able to catch the varmit in the big Have-a-Heart trap. Thanks to all who sent suggestions for the best baits, looks like eggs and sardines are universally successful around the country. I went with the sardines option (in Louisiana hot sauce) and the culprit managed to get the sardines out three times without getting caught in the trap! I was beginning to think this was the Cajun Einstein of raccoons when it started to eat ripe melons out of the other tunnel and carrying them a hundred feet away. Now I suspect our varmit is a fox. 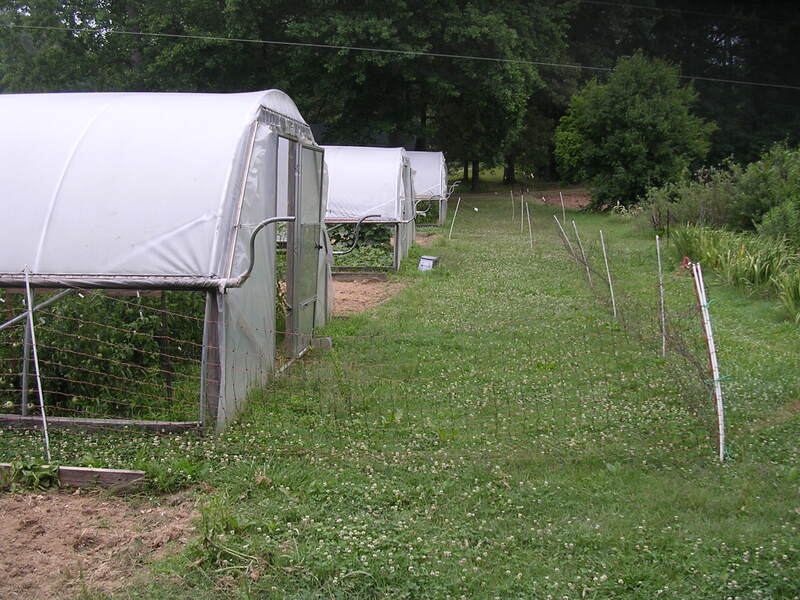 The fencing has worked to keep it out of the tomatoes so the last job yesterday (on top of everything else) was to surround the melon tunnel too, it looks like a medium security detention center out there now. Medium security electric net fencing around the tomato and melon tunnels.